Hi guys! 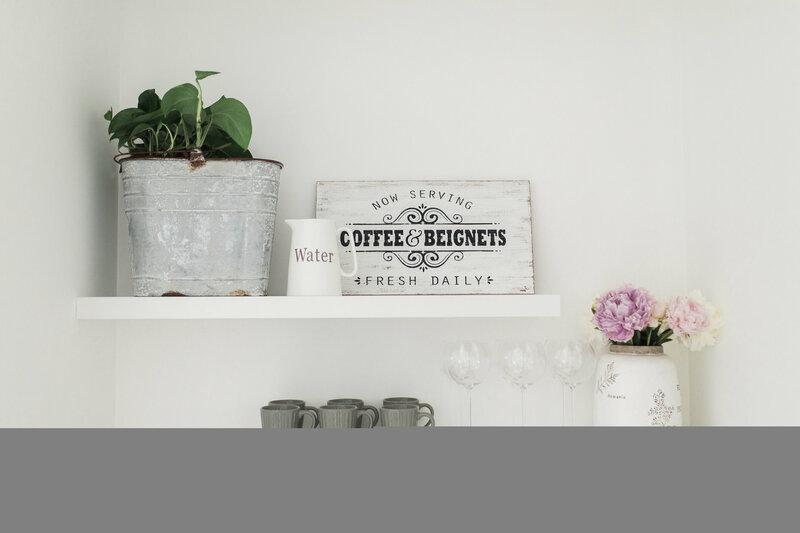 Welcome to the second blog post in my home tour series! Today I’m inviting you into our bedroom. I’d like to say this is where the magic happens, but right now this is where I am up every few hours nursing my son and getting spit up all over me! Ha! 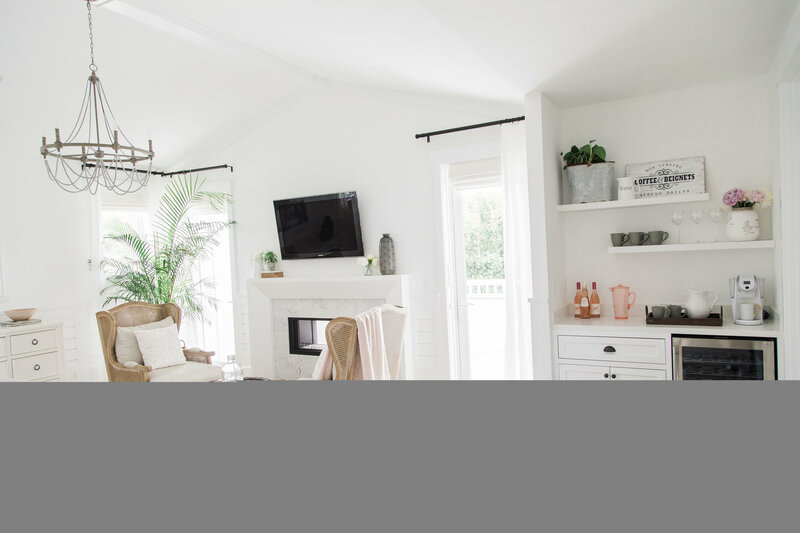 Like I mentioned in my first home tour blog post where I shared details on everything in our family room, I could not have done this without our designer Veronica Valencia! 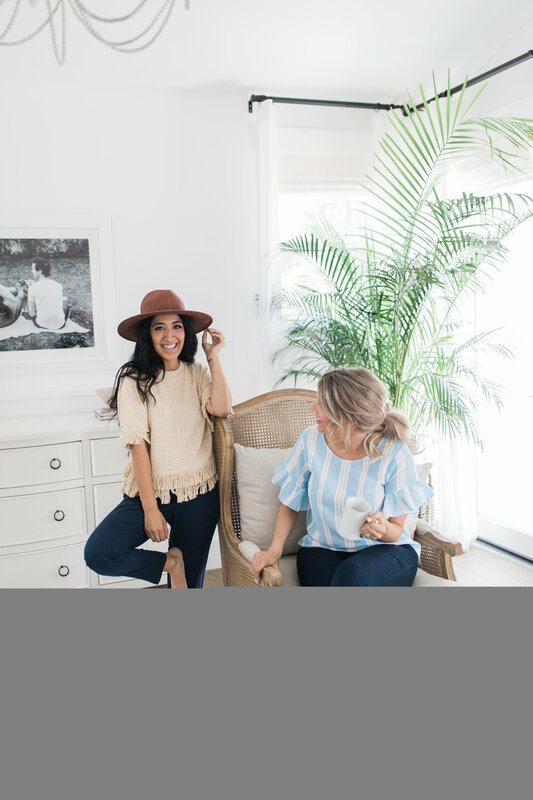 She completely understood the vibe I wanted in our home and turned what was in my head into a reality for us! She’s just the best! 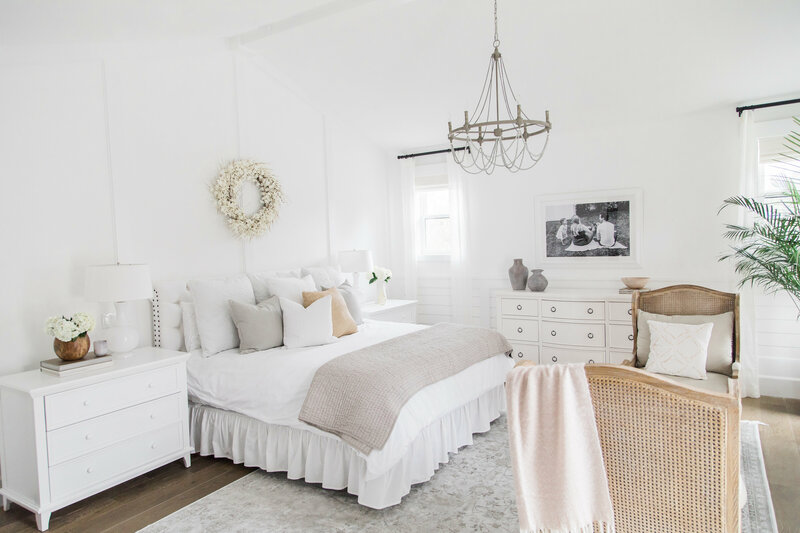 When Veronica and I first started talking about the bedroom I told her I wanted it to be very white and bright! This is mine and Kevin’s sanctuary. Yes, the kids will be in here every once in a while but for the most part I wanted this room to be somewhere that Kevin and I go to feel at peace. I also wanted it to be an adult space – meaning I wanted it to have a certain level of sophistication, and feel like a place we could go to escape the kids when need to. Ha! Any parent out there knows getting away, even if it’s just in your bedroom, is so important when you have children. Hence the wine/coffee bar in our room! So let’s get into it! Let’s start with the bed area. The headboard is one I’ve had for a while. We got it from Pottery Barn and I love it so we decided to use it in this space instead of getting something new. Hey, when something isn’t broken, why fix it?! Right?! And this headboard works perfect for us! But what I really feel makes this area are the dressers on the sides of our bed. I had always thought that you should put nightstands on the sides of your bed and that’s what we’ve always done. But if you have the room, I definitely suggest trying dressers! Veronica suggested we do this! It was such a great idea! She told us that if we had used side tables they would’ve felt much too small in the space. And I totally agree with her. Because of the high ceilings in our master bedroom and it’s large size, we definitely needed something bigger. So if you have a master bedroom on the larger side you should for sure put dressers next to your bed. But you definitely want to measure the height of your bed beforehand. Some dressers can be really high and that could feel awkward next to your bedside. So I would look for one that’s just a few inches taller than your mattress. And as you can see from the photo above, I really wanted it to feel very white and bright around our bed for two reasons really. 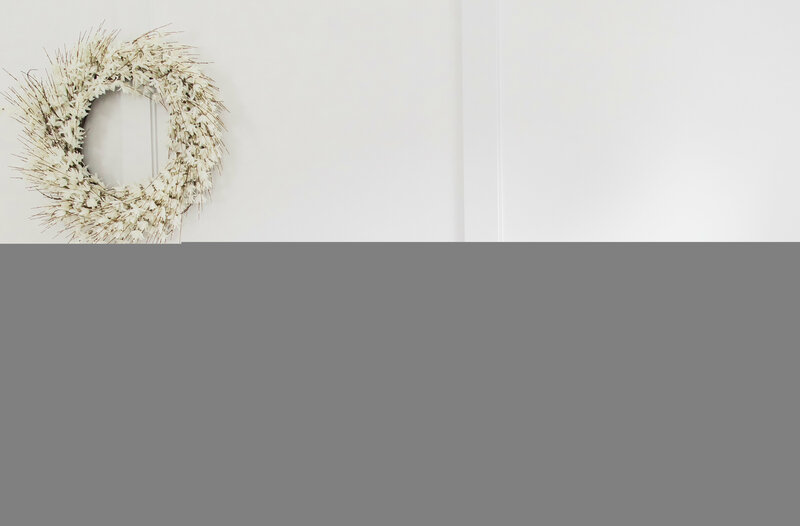 One, I shoot a lot of blog images in our room and I wanted it to be pretty for photos! Just keeping it real with you guys. 😉 And two, I just like how it looks in general. We could’ve gone with a wood-tone or color for the bedside lamps but we stuck with all white once again. We also added a white pitcher for flowers. This was also Veronica‘s idea. I love putting flowers in a pitcher as an alternative to a vase. And of course we added a little bit of wood-tones by including a wood vase for flowers on the left side of the bed. And don’t forget coffee table books! And how pretty is the wreath above our bed?! We got it here, but it’s sold out so I found an identical one HERE. We kept our bedding super simple with all white pillows in the back, touches of gray, and a burlap pillow in the front. And our bedding is really just white sheets and a white duvet cover that we put over our old comforter. Oh and I have to talk about my absolute favorite thing in the room before I go any further! And that is the rug! I love this rug so much that I actually got it for two different spaces in our house. In fact, we originally got a rug that was over $5000 for our bedroom. I know I know, that’s a ridiculous amount of money on a rug. And I had buyers remorse very quickly after getting it. It just didn’t look that pretty and bright in our room. It kind of had a dingy off-white color. So when I found this rug on Wayfair.com, I was crossing my fingers that it was going to be as bright and light as it appeared in the photos. And sure enough it was! That’s one of the things I really appreciate about Wayfair’s site, what you see is what you get. Oh and this rug is also super affordable! The size we got for our master bedroom is 10×14, which is a HUGE rug. And it was under $400. That is an insanely good price for a rug this size. Most people only need a 6 x 9 for many rooms in their house and at that size, you can get it for $150! I’m telling you, if you’re looking for a light and bright rug for a space in your house but don’t want to go with all white, then this is the rug for you! 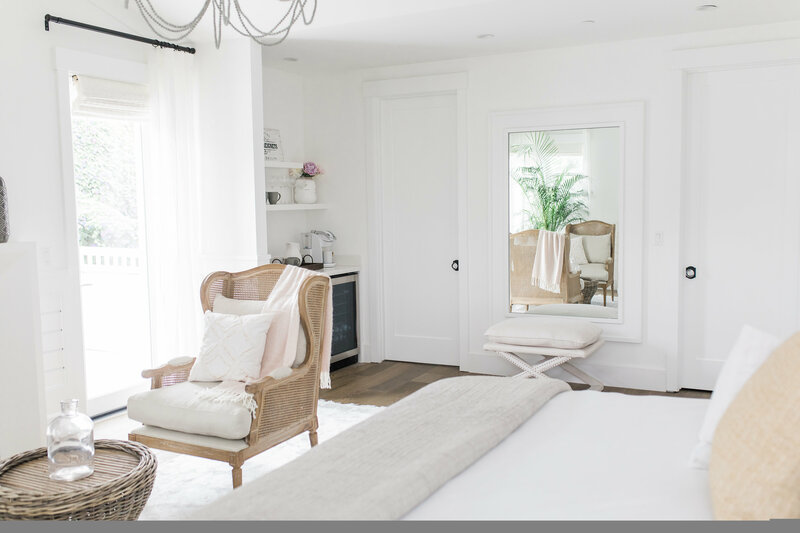 Another element that makes the room feel super light and bright are the window treatments! I actually wrote a blog post about the blinds a little while back and asked you guys for your opinion on what color I should get! I ended up going with the Veronica Valencia Island Woven Wood Shades in Austral Island. So pretty right?! Thank you so much for helping me pick them out. They look absolutely gorgeous in the room. And as you can tell by the name, it’s my designer Veronica’s line! We have them throughout our house in different colors and I will be sharing all of those colors with you as I continue sharing the different rooms in our home. The black curtain rod‘s and sheer white drapes are from Loom Decor FYI! I love the contrast of the black and white! And I know I keep talking about Veronica teaching me things when it comes to design, but the reason I keep talking about it is because she taught me so much! I thought these chairs were beautiful on their own, and they totally are, but Veronica told me that she usually always adds an extra pillow that didn’t come with the chair when designing a room. It just makes it feel more unique and special. So we added these beautiful white throw pillows to each chair and I definitely think it makes them even more special! Oh and a couple ottomans are in the room to provide more places to sit or as Kevin likes to say, more places for me to throw my clothes. Ha! Ok now I want to talk about our coffee bar/wine bar area! How cool is it?!?! When we first moved into the house, we had this area set up as a diaper changing station. And to be honest, it was pretty awesome! I almost felt like the area was made for changing diapers. But we wanted to add some shelving to make it not feel as bare, and after we did that Molly’s head almost hit them so we decided to move the changing station area to the dresser. If we only had Molly, we would move it to her room, but since I’m changing baby Riley’s diaper a lot in the middle of the night right now, we just moved it over to the dresser for the time being. My absolute favorite thing over by the coffee/wine bar area is the Coffee and Beignets sign! I got it from a small Etsy shop and I just think everything the owner of this shop does is the cutest! I have multiple signs of hers and I got a super cute wreath from her shop that’s hanging on our front door. I posted it to Instagram stories a week or so ago and got so many DM‘s asking about it so I will link the wreath here as well. I don’t have links for everything in the area since I can’t find everything online. But our gray coffee mugs are ridiculously affordable at only $2 each. And if you’ve been following me for a while, you know I’ve had these long stem wine glasses forever! I’ve been told they’re the same wine glasses that Olivia Pope drinks out of on the show Scandal! I just love how long the stem is. It makes me feel like I’m drinking a super fancy glass of wine even if the bottle I’m drinking is 5 bucks. And I know you guys are wondering about the wood beaded chandelier in our room! I fell in love with this chandelier the moment I saw it! And I’m actually pretty bummed to say that the second I saw it, I bought it at almost $500! I just loved it so much and honestly $500 for a gorgeous chandelier like this isn’t bad. However, while I was writing this blog post and looking for links for you guys. I stumbled across the exact same chandelier on Amazon for way cheaper! So as much as I love it, I’m super bummed that I didn’t find the more affordable option earlier. It’s the exact same chandelier, just a way better price! But at least I’m happy that I found a better price for all of you! The chandelier would look absolutely gorgeous above a dining room table or in a bedroom like we did in our master. And last but certainly let least is our white dresser. What I love about the dresser is it kind of has an antique vibe. Something about the shape and hardware on it makes it feel like it’s not brand new. Which I love! I also love that it doesn’t completely match the dressers on either side of our bed. While we were designing, Veronica stressed the importance of not buying complete bedroom sets when designing your spaces. It makes it feel more custom if you mix and match pieces and I couldn’t agree more! Oh wait, did I say the dresser was the last thing I want to talk about? Just kidding! You guys know I can’t write a blog post without mentioning my outfit details. You may have noticed by now, I wear this blue striped top all the time! It’s one of my absolute favorites and under $50! And as you guys also know, because I wrote about it on Monday when I talked about my postpartum body here on my blog, I have some extra weight and fat around my midsection that I’m definitely trying my best to camouflage. What I love about this top is that it’s loose around the stomach and provides a cute little ruffle sleeve to cover the top of my arms. My postpartum body isn’t what it used to be and that’s OK with me! But I’m going to find clothes that make me look and feel my absolute best! Speaking of which, if you have a pouch of fat in your lower belly like I do, high-waisted jeans are the best! Really, they’re the only kind of jeans I wear right now. Having them come up over my stomach and push it flat makes me feel so much more confident. The ones I’m wearing are only $59! And these high-waist jeans are another pair I own (and the BEST!) that are on sale for under $100! Well there you have it! I hope you guys love this room as much as I do. What’s your favorite item in the room?! I’d love to know! Tell me in the comments below! And of course, let me know if you guys have any questions at all and I’ll do my best to answer all of them! Thanks for the love Charmaine! Just wondering..,How are you always the first one to comment…every single time? Just curious! I’ve wondered the same thing lol!!! She is on mixandmatchmama.com site too! I believe she lives in Hong Kong, so the time difference helps! Your home and family is so beautiful. 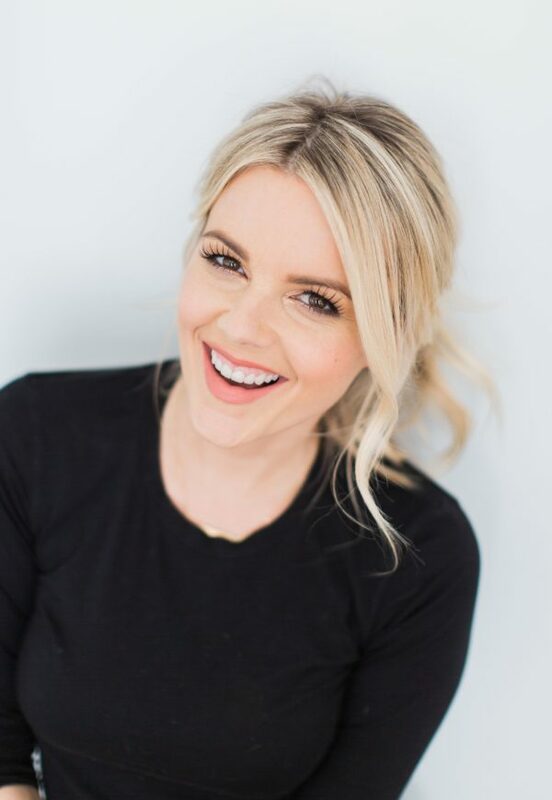 Are you doing a bachelorrette blog this week? Not this week Sheila! Sorry! I didn’t even watch yet! Oops! I hope to watch this weekend so I’m caught up to blog next week! DYING over the coffee/wine bar area! Thank you! It’s soooo cool! Love this! It’s so bright and refreshing. Your new home is gorgeous! Beautiful home and family! I’m just over wishing I had your impeccably clean home! It’s not always this clean! But I’m lucky to have a husband that’s a neat freak! Ha! Amazing! You can pretty much live in your room! 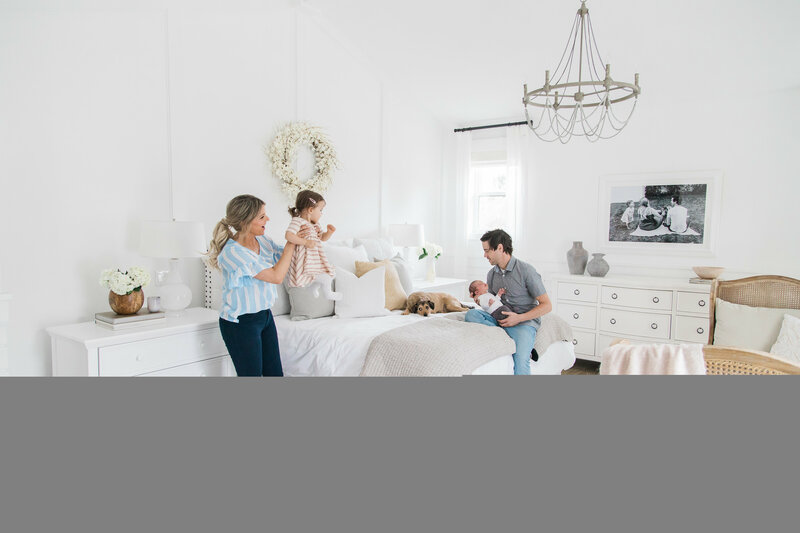 Did you know Wayfair posted your bedroom photo on their website for the rug? How cool is that! I have been decorating the living room of my and my fiance’s home and was inspired by your last home post. It was just a lot of white and getting a little boring so after seeing yours, we threw in some blues and greens and I’m LOVING it! Thanks for the continued inspo! So cool! Can you post the link to my picture on the site? I wanna see! And I’m so glad my living room gave you some inspo! yay! It is a lovely room! You write a great summary of the design process, thanks for sharing. Thanks Andrea! I wrote this one SUPER quick! It’s been a busy week! Love it all. So bright and airy. Does your fireplace go through to the outside of your house also? Looks like it. Love!! It does! There is a balcony out there. So you can see it on both sides. It’s pretty cool. Ali – How wide is the wall behind your bed? Just trying to figure how wide of a wall you would need to accommodate the width of the bed and to use dressers instead of nigh stands. Also – how tall are your ceilings in the bedroom? That was veronica’s idea! We aren’t super into big family portraits in our house (not that there is anything wrong with them. Just not our style). But we liked this photo because it felt more like art since we aren’t facing the camera. 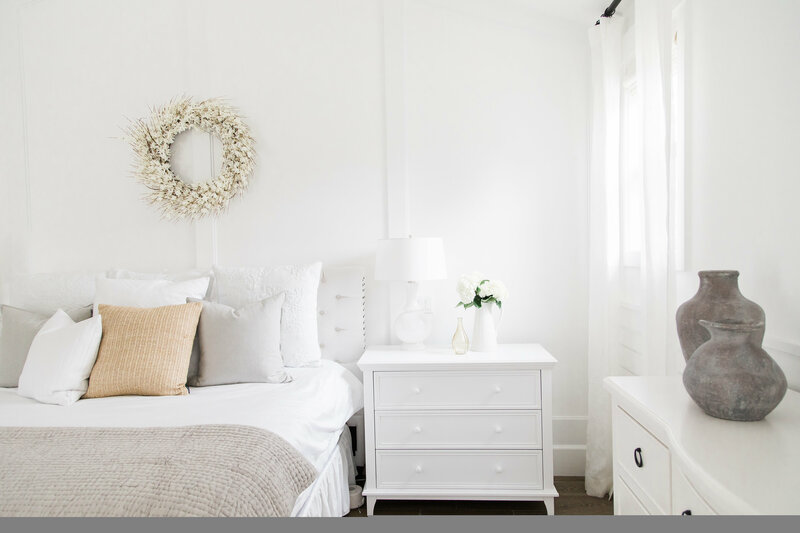 I am really into white bedrooms with a touch of greenery, like your large plant in the corner. Love love it!! Everything is gorgeous!! And once again, thanks for the vunerabilty about your pp body. You truly are gorgeous! Beautiful room! Where are your chairs from? Oh my gosh. The coffee & wine bar IN the master bedroom is genius!! I’m always asking for tea in bed. And let’s be honest a glass of wine in bed at the end of the day when the kids are asleep in kinda great too! OMG! I love it!!!!!! Beautiful room! Love the coffee space! Absolutely beautiful!!! The prettiest bedroom I’ve ever seen. So much glamour like old Hollywood but so hip and modern. Great job!! Awwww thanks Mimi! Veronica’s vision came to life beautifully! The coffee/wine bar is such an awesome idea. I’ve got a blank space in my master where I could replicate! I really like your bedroom!! It’s a beautiful retreat. What flooring did you use throughout the house? Is it tile? Will you ever be revealing your wall color? To be honest i dont have a favorite thing from your bedroom because everything in there is my favorite! It’s all put together so perfectly, everything flows and looks so relaxing! (Definitely looking into getting your rug as i’ve been looking for something bright but yet not white haha) Great job! Love your house so far, beautiful! Love all the white just beautiful. Sensational Sanctuary ! Where are the beautiful chairs and round rattan table from? I need those in my life. Thank you for sharing. Everything is beautiful! What hardwood did you use? I would actually love to know the answer to this as well. We are doing a new build and going crazy trying to decide the right flooring and love yours. I also know they look different depending on the light when you take the picture. Thank you so much!!! Hi! Absolutely love this room and your home pictures! I was wondering what color paint your walls are? I am THE worst at picking out paint colors and I know there are a thousand shades of white. 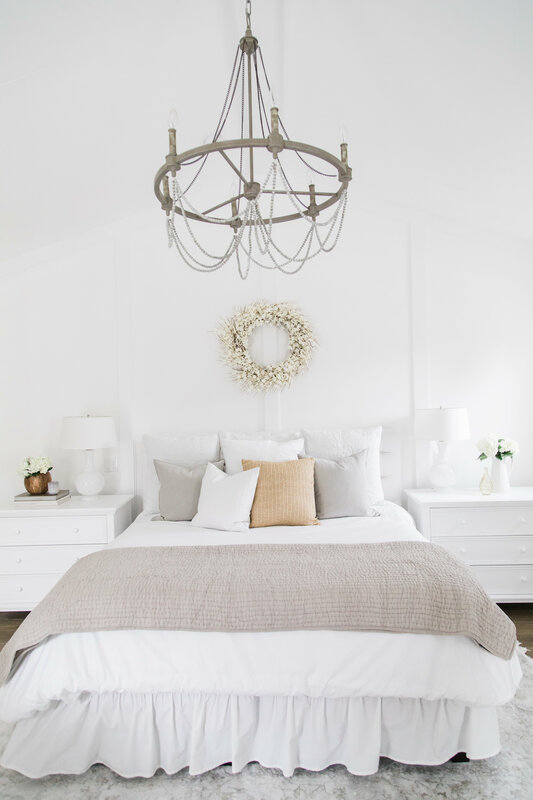 I’m looking to repaint our bedroom a shade of white and love the one you have! Love the greenery in the bedroom. Is the big fern plant in the corner real or fake? Where did you get it? I would love to know the answer on the plant as well. Where did you get it? Good ones are not easy to find. Thanks much! I agree! Beautiful plant, where is it from? Beautiful, serene, romantic, fun and functional to the max! I’m on LoVE with the sitting area and that big plant in the corner! Seriously love it! Great job! Now I’m rethinking my own bedroom lol! I need to know where u got your bed skirt from. I can’t find a good long one to save my life. Help!! how on earth do you keep it sooooo clean with kids?? Can you tell me more about thst amazing mirror please? Ali, your master is really beautiful but I don’t know how you keep it so clean with little ones and a dog and it is white. I have hardwood floors with a dog and cat with color and I still struggle to keep it all clean with no children. How do you do it? It is so beautiful you are a special mommy with special mommy skills to do all that and more. Your family is so beautiful and you are lovely, never doubt yourself. What an amazing room! Where did you find the tall plant? I’ve been looking for something like that. Love your bedroom! Question about your blinds and sheer curtains, in the morning do you have a problem with the sunlight and it being so bright so early that it wakes you? I’m sure currently sleep is more of a luxury with a newborn but I’m always looking for cute white blinds or curtains but blackout for the morning. Ali, I’m so envious of your house! I’m currently renting so my designing can only go so far, but one day I do hope to purchase a house and would love to have a designer help me make it feel like home but also fit my personality. Hi Ali, did you put in the shelving for your coffee bar yourself? If so, where did you find your shelves? I’ve been thinking about putting shelving above our laundry room, but am nervous about finding good quality ones that can handle some weight to them. Thank you! I love the wine/coffee bar area! It’s so genious! I’m just curious though, do you actually ever get to enjoy a morning coffee in there? I have 3 little girls and can barely enjoy a coffee at my kitchen table let alone in my bedroom haha! I could see how it would be great for an evening glass of wine though. The room is beautiful! TOTAL BEDROOM GOALS!! Our bedroom is the only room in our home that we’ve never put any money or design into, and this has now inspired me! The coffee and wine bar is genius! So beautiful and relaxing. I’d never leave! Master bedroom goals!! I especially love the seating area in front of your bed. Saving this post for the day we have a bedroom with enough space to do something like that 😜 Also.. where did you get your coffee maker? It looks like it’s white and black and beautiful!! Wow! I have such room envy now. It just looks so stylish as well as being extremely practical. I would never think to put a hot drink area in a bedroom. I am in the UK so not something you see here but looks so good. Also we don’t tend to have fires in the bedrooms but this looks so cosy even with such bright whites and makes the room multi functional and suitable for more than just sleeping. You can really enjoy this space for more than just a bedroom. Job well done! Omg! I love your style! I love that double fireplace going outside to your deck area! And I love all the white and the trim! Oh and the wine/coffee bar! Amazing! We wished we had put a deck off our master overlooking the pool. Your home is just beautiful!!!! Love the room! I have a white room (and house) as well and was trying to go for the sanctuary affect as well. One question-where did you get your drapes? Thanks Ali! Your house is absolutely stunning, but I would never leave this fabulous bedroom! Love the coffee/wet bar idea. I never thought about the whole “don’t get matching sets” thing and I totally agree with that, and will keep in mind for the next house. Now I want to redo my entire house 🙂 Thanks for sharing! You definitely pulled off the peaceful feeling. It’s gorgeous. I LOVE all the white. 🙂 Is that ship lap on the walls too? Thanks for the tour. What color did you paint your bedroom walls and is the woodwork around the doors and windows the same paint color or is it different? The chairs are stunning but the ones linked on wayfair look like a more affordable version of yours. They don’t look as grand. Maybe it’s the lighting but they’re stunning in your photos. Hey Ali! I am thinking about purchasing this rug for our living room in the new house… is it pretty cushiony and soft or would you recommend putting a mat underneath of it? I have 2 small children, one of which will be crawling around on it. Thanks! What’s outside your window, a balcony? Can we talk about the tree/plant in your bedroom? What is it and is it real or fake? I think it adds something special to that corner! Ali, I simply adore your bedroom. It is so classic, rich and casual all at the same time. Just my type of space. Two questions! How did you get Kevin to agree to so much white? 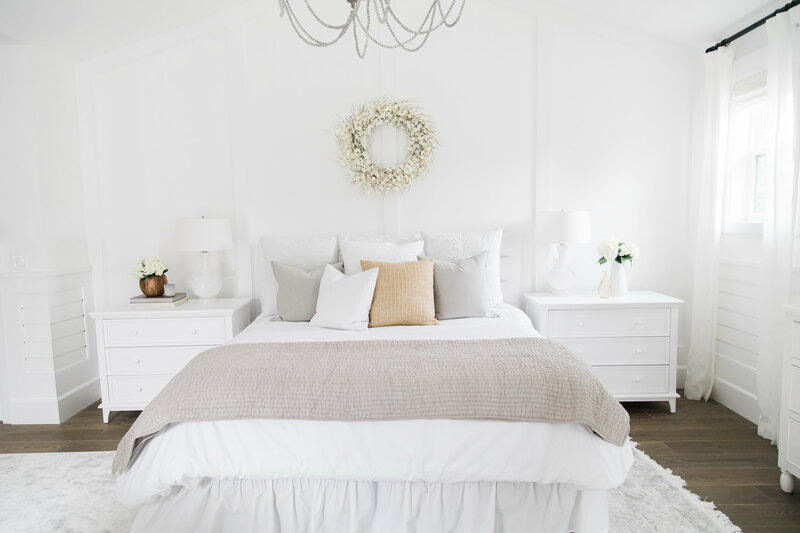 Every time I mention going all white in my Master Bedroom, I get a “are you crazy” look from my hubby. Secondly, I was interested in the flooring in your bedroom. It is simply beautiful and I was wondering if it is hardwood? Really enjoying seeing your new home! Is the rug the ivory color or the silver? This is exactly what I have been looking for! Your room looks beautiful! Thanks for sharing! I loved your blue top from Nordstrom that I ordered it right away. Dumb question but what type of bra/ or Cami do you wear under it or does it bother you if the bra straps show? Where are the curtains from? Your room is so beautiful! Digging the look of this whole room, and taking inspo for our home renovation! Please let us know where Veronica’s fringe top is from!!! I love it! Where is your plant from LOVE it ! I LOVE YOUR BEDROOM! Wow so gorgeous! Buying the same rug now- it is the ivory one, right? and not the silver? Please share where you got that bedskirt… so pretty!!! Love your room. Ali, before I go ahead and order this amazing rug (cannot believe how cheap it is! ), I wanted to make sure – your rug is the “Ivory” and not the “silver” (sold out), correct? Thx a bunch! Do you know where you found the small table in between your Wayfair chairs? Hey Ali, I love the pictures you post in your house. It looks so beautiful, specious, bright, welcoming and loving. I am 24, I finish with my bachelors degree in May and I am looking to buy a house by the end of summer. Would you be able to post more pictures of your living and dining room? I can’t find any on your blog. You are so incredibly beautiful love your taste in the house decor and fashion!! The mirrors you added behind the dressers, not pictured here. Can you link where they are from. I saw them in another post. Love them. So excited the rug is back in stock! I have been holding out on a new living room area rug until it was! I love your style! Following your blog has made purchasing so much easier! Thank you! Hoping you see this, as it’s been a long time since you posted. 🙂 My hubby and I are redecorating our house one room at a time and my first thought was “I need to look at Ali’s website for inspiration!”. I don’t see a link (or mention) of the little round table between the two chairs. Any chance you still have that information? Your house is BEAUTIFUL!!! What kind of plant is that? a palm or fern variety? I see several have asked but you didn’t reply so possibly you didn’t know at the time as your designer may have ordered but I would love to know as it would look great in our living room as well!